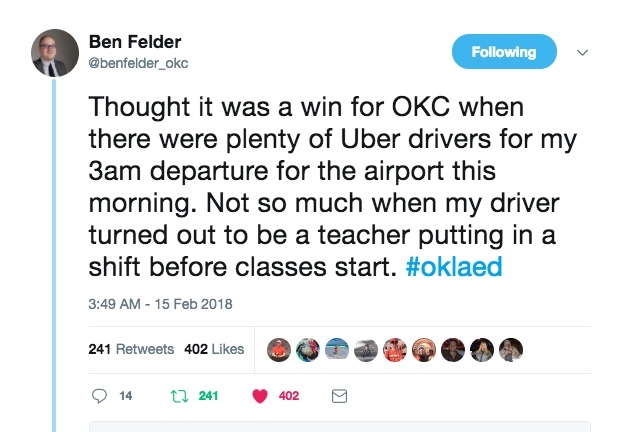 N ow have a look at this twitter thread from Ben Felder, an education reporter for the Daily Oklahoman. Ben needed an Uber to the airport at 3 a.m. He was pleased to see that there were several options – turns out his driver is a teacher, who grades between fares. This isn’t right. No teacher should be working as a middle of the night Uber driver. They should be sleeping and getting ready for teaching students the next day. I remember watching CNN coverage of the Columbine school shooting as a young teacher. It was shocking to me that anything like that could happen in a school. I found myself watching the news this morning about another horrible school shooting, this time in Florida. I was horrified, the difference now is that I have my children in school. What if one of those kids was my own? No student should ever fear for their safety in a school. No parent should ever worry about their children who are in school. Schools should be a safe place. It sometimes does not feel that way. At what point do we say something needs to change? How many more precious lives need to be lost? You are a hero. When there is danger in school, you are a sense of calm. You help protect kids when tornadoes make a direct hit on your building. Provide direction in times of chaos. You sacrifice yourself so that your students will be safe. You are an encourager. When a student says they can’t do it, you speak life into them. You create an environment where students are willing to thrive. You don’t let students settle for anything less than the best they can give. Even when your students think there is nothing left, you bring the best out. You are a role model. You have the opportunity every day to be an example to your students. It doesn’t matter if you teach pre-k or AP Calculus, your students look up to you. You show them how to be empathetic. You’re a consistent presence in their lives, some of your students need that consistency because they do not get it anywhere else. You are a coach. Some of you take on extra duties, to pour even more of yourself into your students. You push them and build them up and teach them so that when the curtain raises up on the next musical, they shine. Hours of game film are watched to help your players be in a position to succeed the next time they take the court or field. You are at the school at 5:30 every fall morning guiding your band through their movements. So they can perform flawlessly at the next competition. You are a difference maker. Ask anyone about a teacher they had when they were growing up, and that person will tell you all about their favorite teacher. Followed by “…made a difference in my life.” Never forget this. Every single day, you are a difference maker. Every single day, you impact a student in ways that you will never know or understand. You are not just a teacher. You are the lifeblood of future generations. Without you, there will be no cure for cancer, no Mars colony, no brain surgeon, or next president. There would be no art or music. No brilliant playwright, or electrician, or lawyer. Without you, there is nothing. You are more than just a teacher. So much more. And as we move through this week, and struggle to understand everything that we have seen and experienced, never, ever forget what you are. Never let anyone say you are just a teacher.